Solar eclipses are not especially rare, but this one is of particular interest as the path of totality will cross some thirteen states. Starting at the Pacific coast around 10:15 local time, the shadow will reach the Atlantic sea-board 90 minutes later. 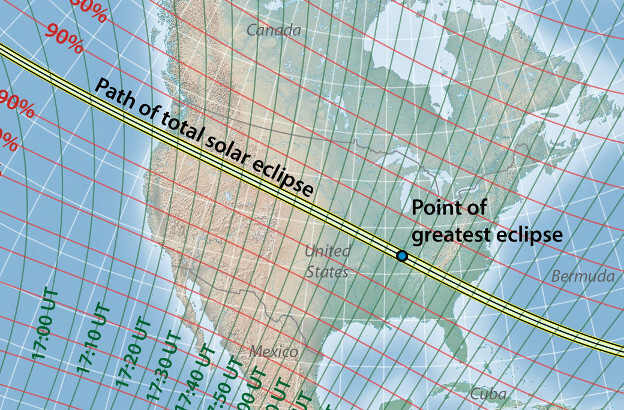 The path of totality will be about 100 kilometres wide while a partial eclipse will be visible over the entire 48 contiguous states. Millions of Americans will witness the grandeur of the solar corona as day becomes night for over two minutes along a path stretching from Oregon to South Carolina. The path is within a day’s drive from almost everywhere in the United States. The duration of totality will be in excess of 2 minutes at the centre of the path. It will be the first total solar eclipse visible from the southeastern United States for almost fifty years. The Sun is 400 times more distant from Earth than the Moon and also 400 times the Moon’s diameter, so the two bodies appear similar in size, viewed from Earth, about a half-degree in angular measure. A solar eclipse occurs when the Moon passes between Earth and the Sun, blocking out all direct sunlight. If the Earth’s and Moon’s orbits were both in the same plane, we would have one solar and one lunar eclipse each month. But the Moon’s orbital plane is tilted, and the orbits are elliptical, so the pattern is somewhat irregular. 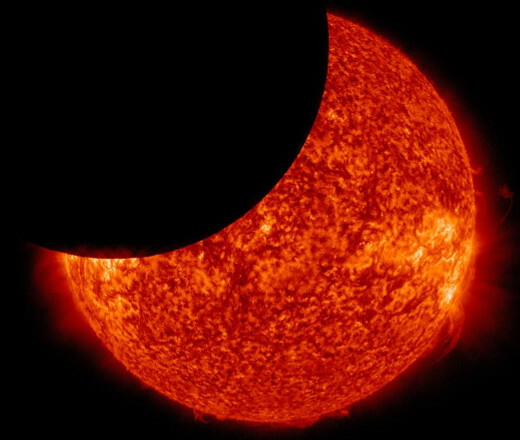 Astronomers have studied eclipses since ancient times. Eclipses were often regarded as omens, usually portending disaster. The ancients observed a number of cycles in the occurrence of eclipses. 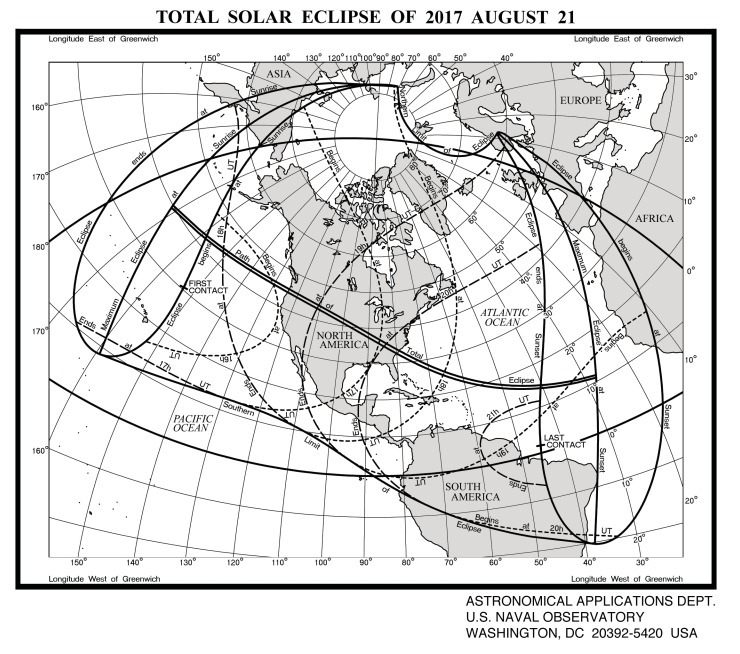 Once the date and time of a particular eclipse was known, it was possible to predict similar events using observed cycles and simple extrapolation in time. The best-known of the eclipse cycles is the saros series, which has a period of 223 lunar months or about 18 years. The 2017 eclipse is a member of the saros cycle 145. Saros was known to Babylonian astronomers and to the Greeks. A mechanism representing it was built into the Antikythera device, a remarkable mechanical computer made some two millennia ago. Modern prediction of eclipses is based on Newton’s laws of motion – what we call classical mechanics. We have precise equations describing celestial motions. We can easily write down the equations describing the future movements of the Earth, Moon and Sun can be calculated, but solving them is another story. It is an example of the notoriously difficult three-body problem. Newton wrote to his friend Edmond Halley (of comet fame) that his calculation of the Moon’s motion made his head ache. NASA has a site (http://eclipse.gsfc.nasa.gov) with a range of maps of the eclipse. It will be updated as eclipse day approaches. Weather prospects along the track are important, but these must be based on climate statistics. While we can predict astronomical events many years in advance, anticipation of conditions in the atmosphere remains a problem and, at this range, all that we can give are the average August conditions. In any given year there are at least two solar eclipses, but they generally occur over oceanic areas, attracting little attention. Total eclipses over populated areas are uncommon. A partial eclipse will be visible throughout the United States, but that is nothing compared to the “total experience”. So get to the path – you have just 732 days (from 20 August 2015). Peter Lynch’s book about walking around the coastal counties of Ireland is now available as an ebook (at a very low price!). For more information and photographs go to RRI.